Here is another way to earn Free points at Recyclebank. This is similar to the Green Your Home Challenge that they had about a month ago. 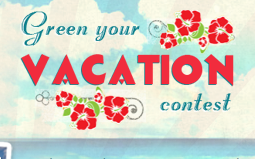 This time it’s Green Your Vacation. The first stop is the Travel Section where you can earn up to 45 points (possibly more). Here is how. Then click on the moving objects and take a pledge or a quiz to earn points. Then make sure to check out all the coupons you can get with your points. One of my favorite coupons is the $1 off Honest Tea. Also, some zip codes may have coupons available for their local supermarkets. And, as always, put your referral in the comments so that others can sign up under you and you all can earn points and great coupons.